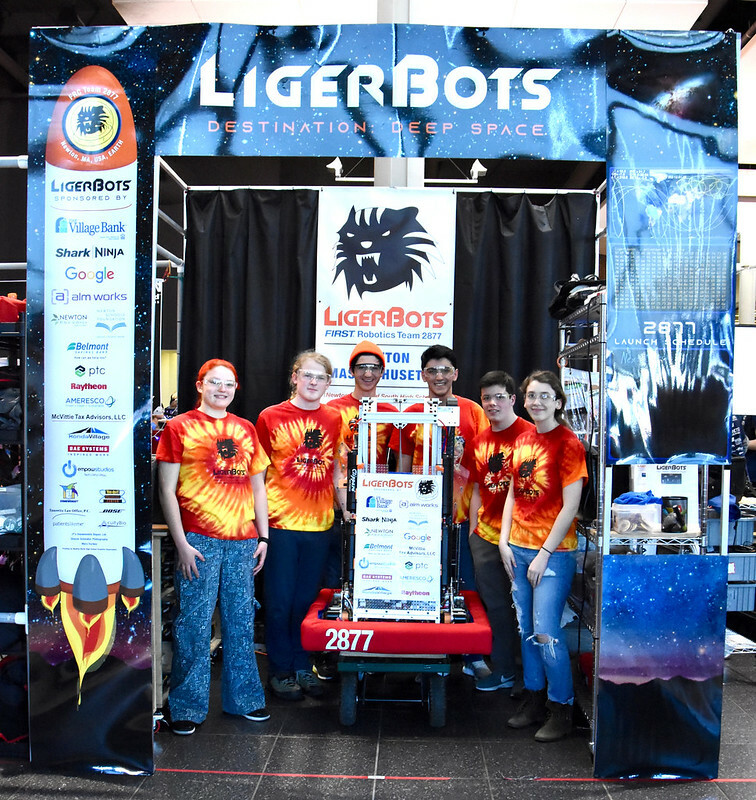 The LigerBots joined 37 other FRC teams to compete in our first Destination: Deep Space tournament on March 9 and 10 at the SE Mass. District Event at Bridgewater-Raynham High School. The LigerBots at the SE Mass. District Competition. 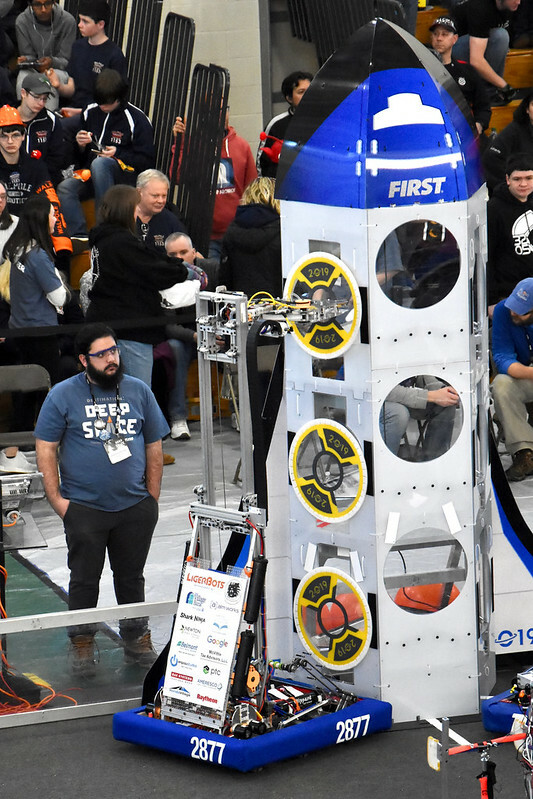 Our robot, Thanos, was one of the fastest robots on the field, swerving to align quickly to targets and consistently acquiring and placing the Cargo ball and Hatch Panel disk without dropping game pieces or missing targets. Thanos, showing its intake and claw extended simultaneously for demonstration purposes. Thanos puts a Cargo ball into the Cargo Ship field element. Thanos places a Hatch Panel disk onto the Rocket Ship field element. By the end of the first day we had the fourth highest number of points scored by any team, and at the end of the tournament we had the fifth highest offensive power ranking (OPR), a measure of our robot’s efficiency at producing points. We were seeded seventh after the qualification matches, but were picked to join the fourth alliance before it was our turn to choose alliance partners. We made it to the semifinals before being defeated by the eventual event champion alliance. Misha and Mark place Thanos onto the field before a match. 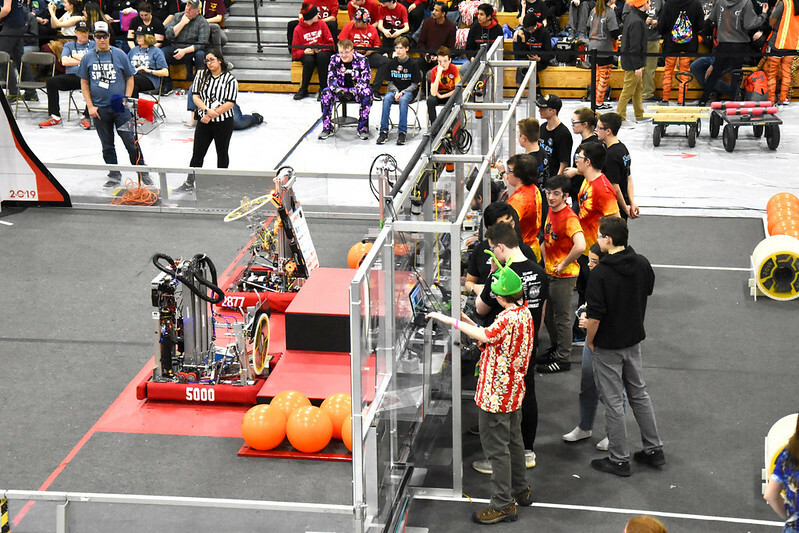 The red alliance prepares to start a match. 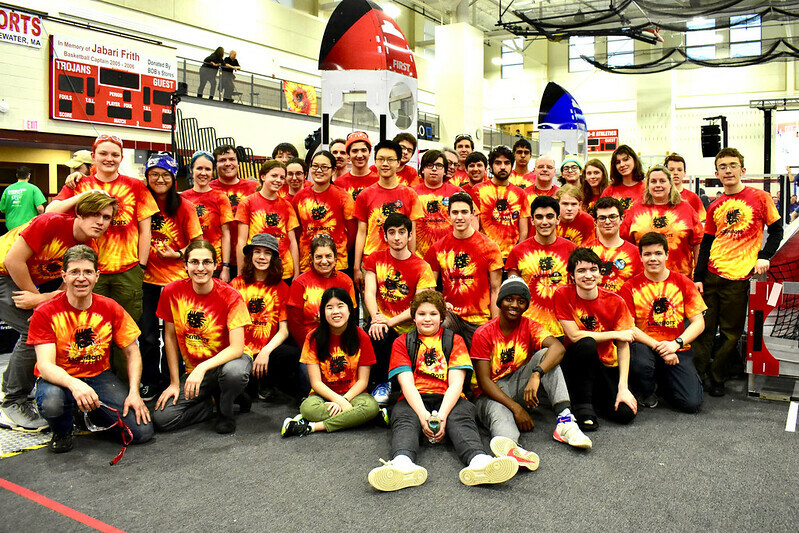 We had a terrific drive team and pit crew making sure that we were usually the best-performing robot in our alliance. The pit crew with Thanos, in our repair pit, at the Bridgewater competition. Left to right: Samy, Asa, Gideon, Ali, Brian, and Maya. 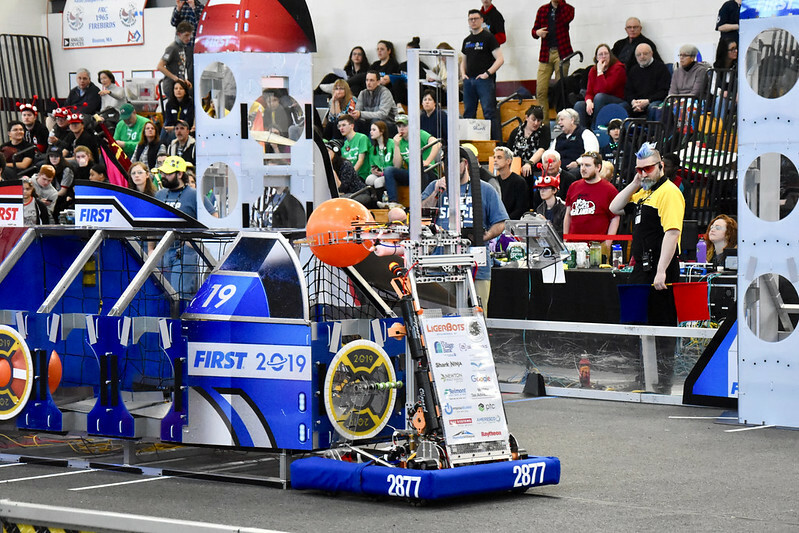 Our expert drive team was able to use the robot’s onboard cameras to see the field and vision targets and do a great job of scoring points manually since we don’t yet have software that will allow the robot to align to the targets automatically. They maneuvered the robot well even when a broken belt interrupted power to one of the front wheels. 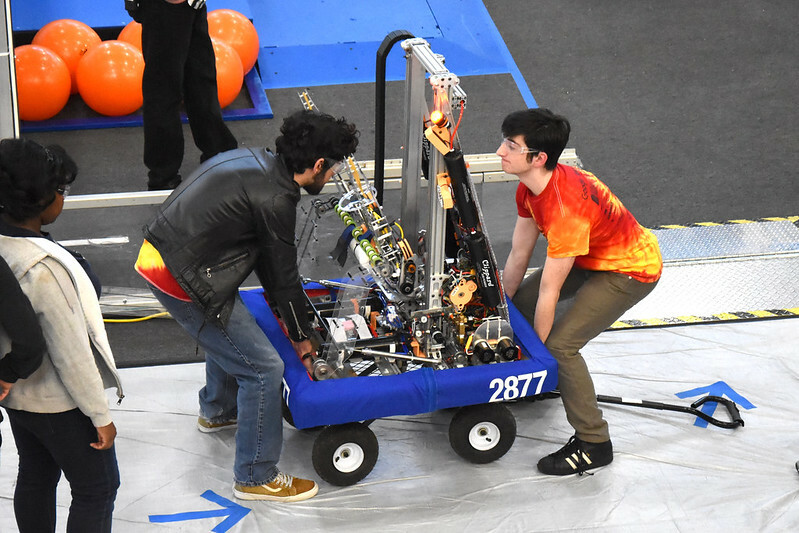 Ethan prepares to load a Hatch Panel disk into Thanos during a match. We had few break-downs, none of them causing issues for more than one match. 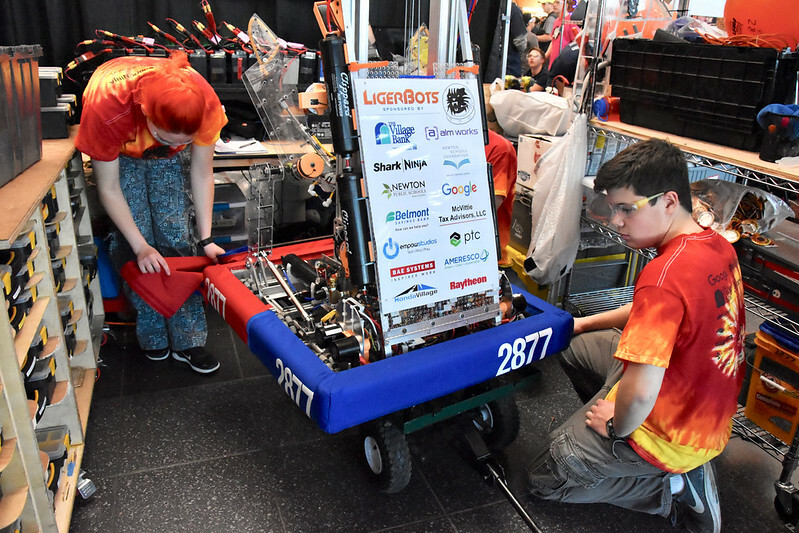 The pit crew was on the issues like white on rice, thanks to a recently developed checklist that speeds up the turnaround between matches. 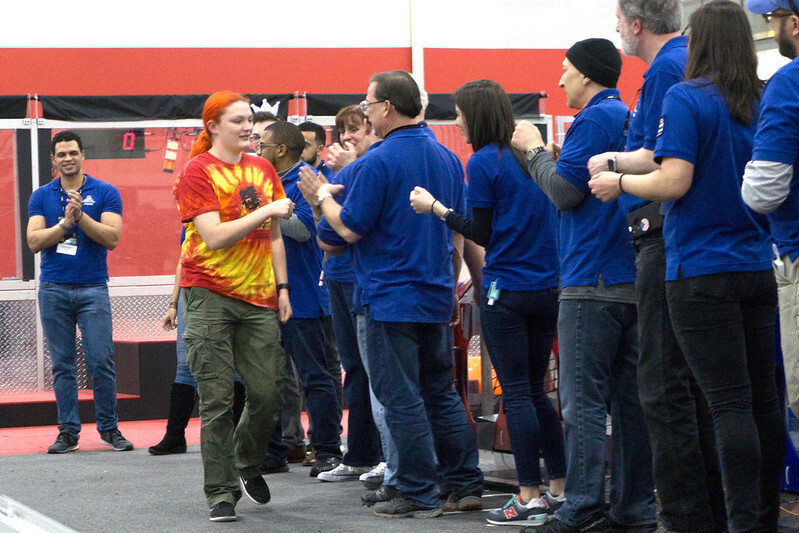 Bolts got tightened, batteries got charged, bumpers were converted from red to blue or blue to red to match our next alliance color, and air tanks got pressurized so efficiently that our drive team captain expressed amazement at how much was done before he even had to think about the next match. Samy and Brian change Thanos’s bumpers from red to blue between matches. 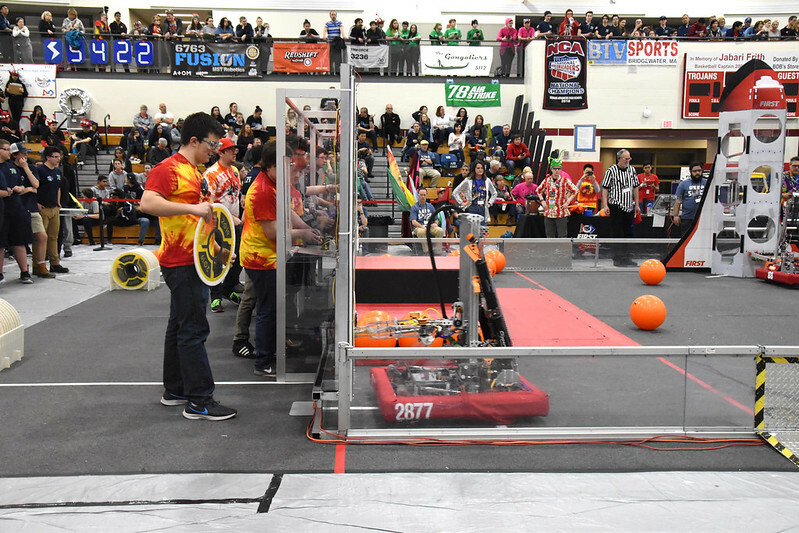 Scouting the performance of other teams during matches was much easier than in past seasons because we shared the task with two of the other teams in our new scouting alliance, team 246 Overclocked and team 6731 Record Robotics. Only two LigerBots at a time needed to stand up in the arena balcony and record the performance of one robot each during a match. 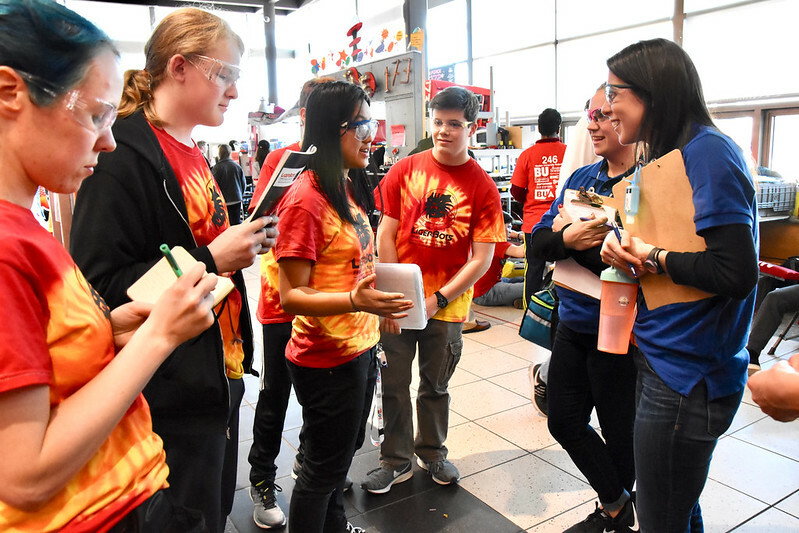 They shared their data with our drive team before each match to improve strategy decisions by our ever-changing match alliances. LigerBots and Overclocked team members scout in the balcony at Bridgewater. 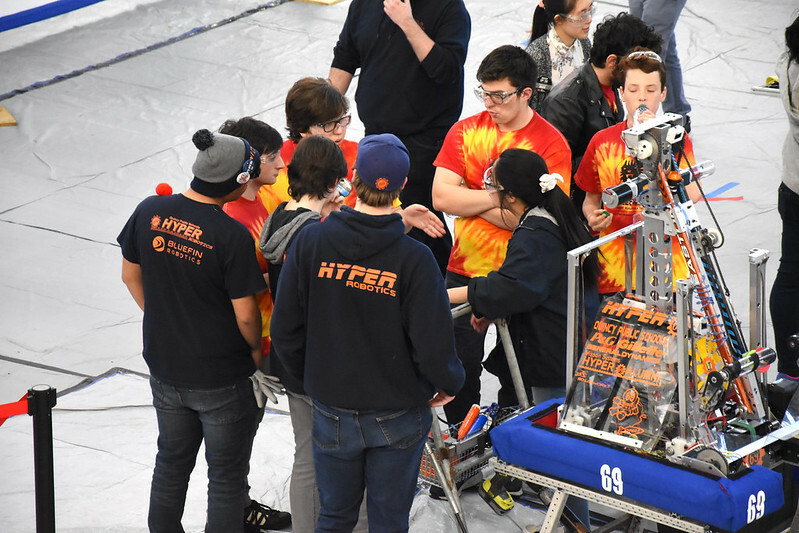 The drive team consults with alliance partners on game strategy before a match. 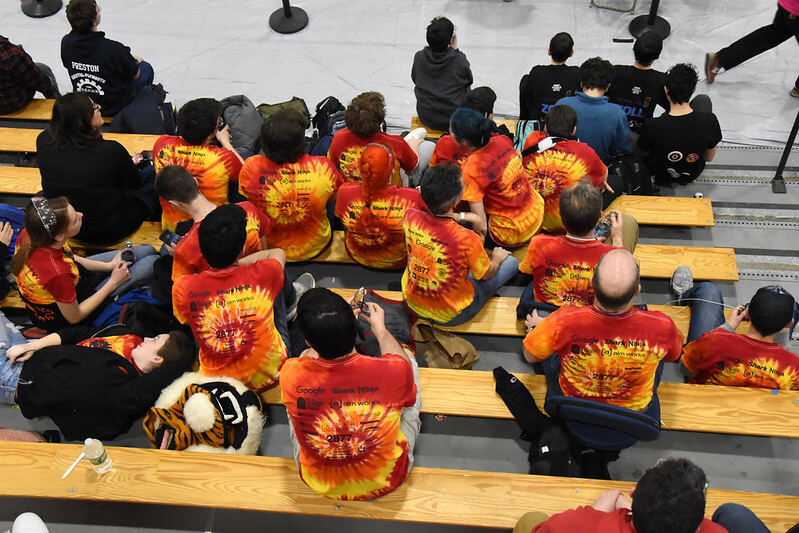 LigerBots who are not on pit crew, scouting duty or drive team watch matches in the stands. The Chairman’s Award group did its first official presentation of the season in what is likely the most competitive field the team has ever faced. In all, 20 teams competed in the Chairman’s category. Despite a good showing, great answers to judges’ questions, and a slick presentation in matching blazers, we lost out to the great work being done by team 125 NUTRONs. The team still took the opportunity to officially release our Chairman’s video, which features original music and lyrics. The Chairman’s Award presentation group at the Bridgewater competition: Maggie, AJ and Carolyn. 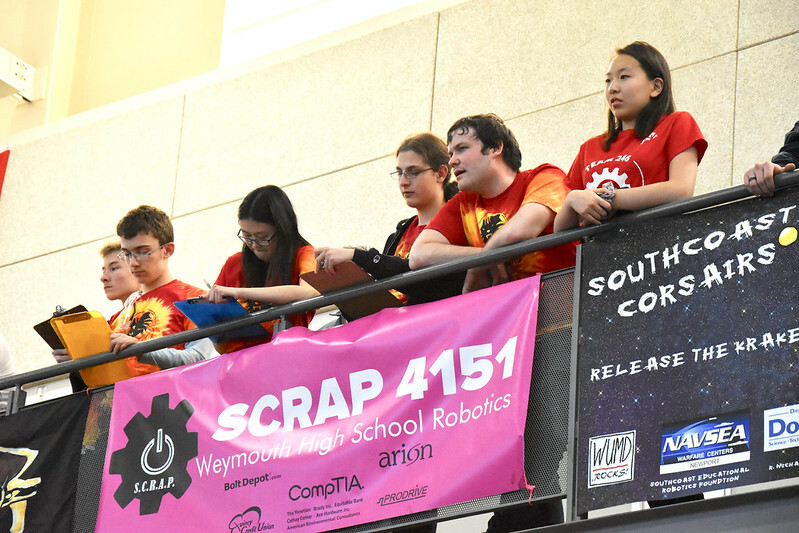 Many team members talked to judges in the robot repair pit to compete for technical and non-technical awards. We used our ongoing training in public speaking to enhance the discussions about Thanos and the LigerBots team structure and projects. Asa, AJ and Brian talk to FIRST judges about the LigerBots, while mentor Carly Buchanan takes notes on the questions they ask so we can prepare even better answers for next time. During the awards ceremony our CTO, Samy, was advanced to the next level in the competition for the FIRST Dean’s List, which celebrates outstanding student leaders whose passion for and effectiveness at attaining FIRST ideals is exemplary. 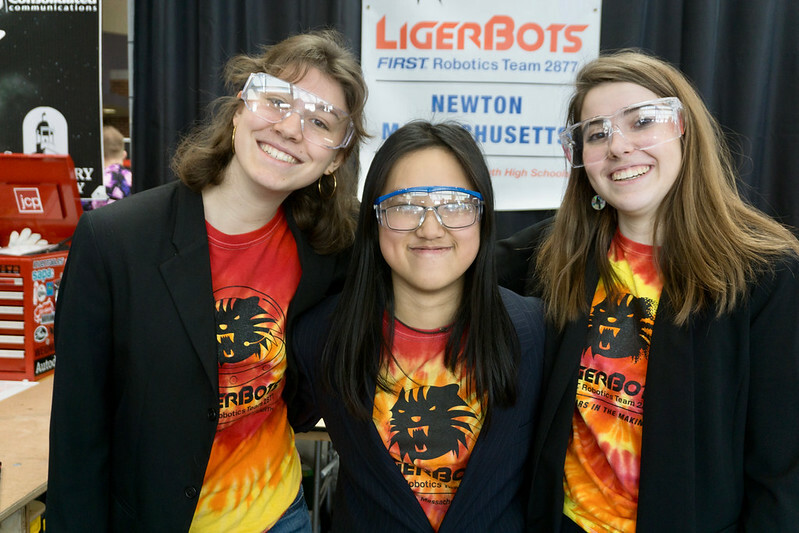 Even if the robot does not make it to the New England District Championship (which we hope it will do!) we will attend to cheer Samy on at the next level of competition. Samy goes through the awards line as she advances in the competition for FIRST Dean’s List. Now we are preparing for our next competition, the Central Mass. District Event at Shrewsbury High School on March 30 and 31. We are planning minor changes to Thanos to eliminate a motor that pivots the claw mechnanism and replace it with a purely mechanical pivoting system to save weight. 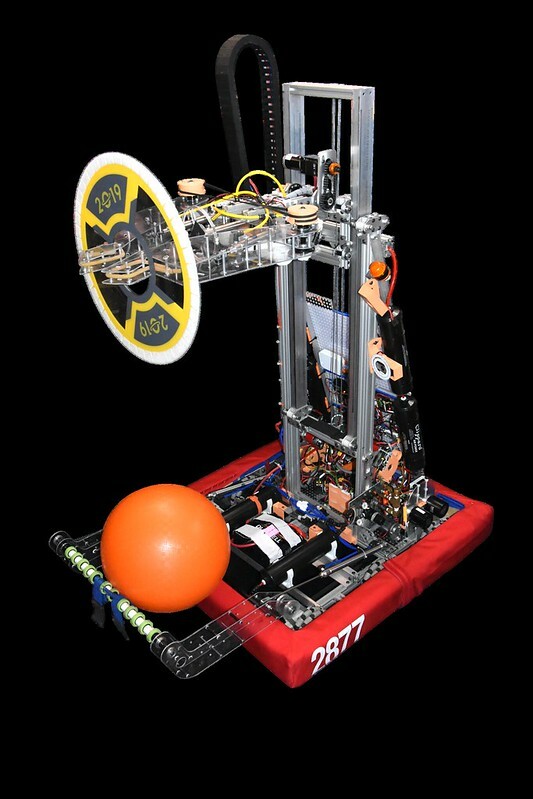 We may change the Cargo ball intake to make it slide straight into the robot rather than flipping up and in, which wastes precious playing time. And we may add a mechanism (a four-bar linkage climber) that will allow us to score bonus points by having Thanos climb onto a 19” high platform at the end of a match. We also are working on a submission for the FIRST Entrepreneurship Award at Shrewsbury and are expanding our quest for technical awards by preparing flyers about Thanos and about our improved design and manufacturing processes. Before we know it, it will be time to compete again!